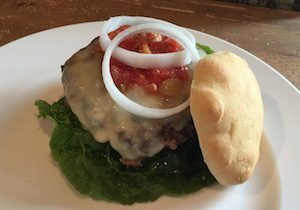 A pan fried venison cheeseburger with salsa on an english muffin roll. When you process a deer, you will always end up with some meat that is destined for the grinder. 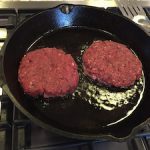 Making venison burger is an expectation for most families, some will even grind the whole deer before they freeze it, making it an easy meal ingredient when needed throughout the year. I often struggle through some internal conflicts when I cook venison. 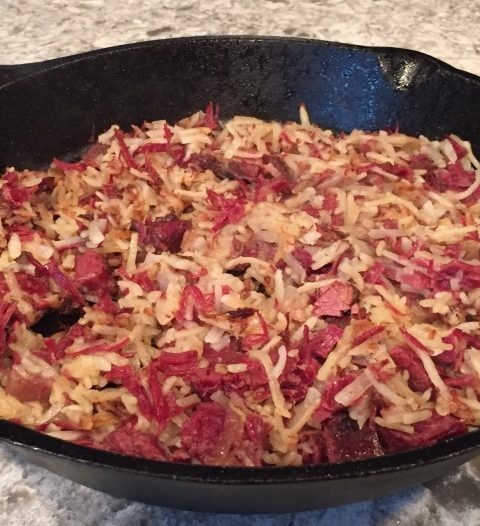 Many venison recipes you see call for the addition of some kind of fat – usually ground pork, ground beef, or everyone’s favorite: bacon! Fat adds flavor and moisture. And fat helps hold your burger together. 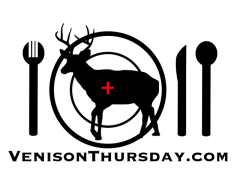 As a hunter though, having gone through the full process of of the hunt, the kill, the field dressing, and the butchering – I feel I owe the deer a bit of purity when I cook it. I’m not saying it’s logical, but anytime I cook venison, I strive to cook it on it’s own, and appreciate it as it is without mixing other meats in. So, what’s the solution? For my venison burgers, I use binders to hold them together and help keep moisture and flavor locked in as I cook them. 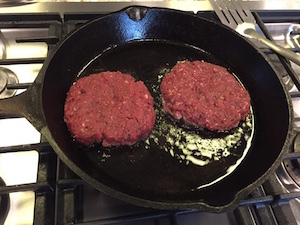 Instead of adding fat to your ground venison, use a binder and pan fry for a perfect burger. There are many ingredients that can serve as binders. Raw eggs are a top choice, but I don’t use them for burgers because I like them on the rarer side. I lean towards dry binders like dried eggs or dried milk. Dried milk is readily available in the baking aisle of the grocery store. Dried eggs can be a little trickier to find as not all grocery stores carry them. With either milk or eggs, I use roughly a tablespoon of binder per half pound burger. Personally, I can’t taste a difference between the two, but as you can see from the pictures, they do cook a little differently. 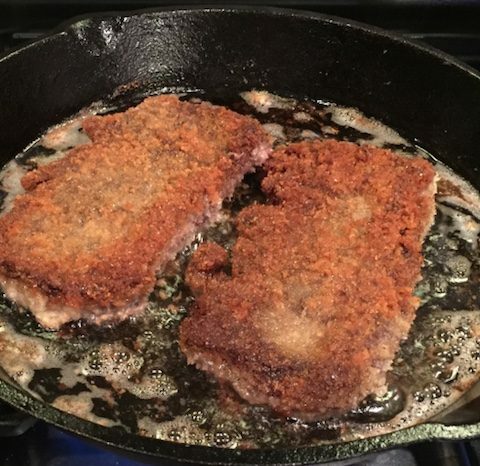 Dried egg seems to give a browner sear, where dried milk sears a little darker. As a general rule, I almost always pan fry my venison burgers as well. This adds a little bit of fat, but let’s you get a good sear on your burgers without losing moisture and flavor to the grill flames. Another reason to keep some cast iron skillets around..
Venison burgers sizzling in the pan. Ok, we know we are using left over bits and pieces that were too small to save as anything else. Keep in mind though, better meat makes a better burger. When I butcher my deer, I like to keep two or three different bags going for my trim pieces. I fill them according to the quality of the cut the trim is coming from. 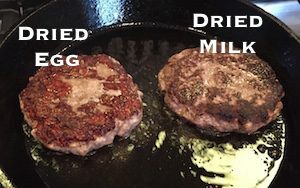 That way I can use a high quality ground meat for burger, and save the lower quality (tougher, more connective tissue, etc.) for jerky. Or sometimes my burger comes from a leftover chunk of a large roast that was too big for the recipe I’m cooking. When butchering, I try to freeze everything as a whole roast if I can. 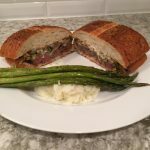 This does minimize my trim meat that ends up as burger, but it gives me more flexibility in the long run – I can pull a roast out and grind it anytime if I need more burger.